1 A None No Power Seat 1 A is a standard First Class seat. However, the proximity to the galley and lavatory may be bothersome. 1 D None No Power Seat 1 D is a standard First Class seat. However, the proximity to the galley and lavatory may be bothersome. 1 G None No Power Seat 1 G is a standard First Class seat. However, the proximity to the galley and lavatory may be bothersome. 1 K None No Power Seat 1 K is a standard First Class seat. However, the proximity to the galley and lavatory may be bothersome. 12 D None No Power Seat 12 D is a standard Business Class seat. However, this area may be noisy due to the bassinet location behind. 12 G None No Power Seat 12 G is a standard Business Class seat. However, this area may be noisy due to the bassinet location behind. 15 A None No Power Seat 15 A is an Economy Class Bulkhead seat that has extra legroom. The tray table is in the armrest, making the armrest immovable and slightly reducing seat width. There is no floor storage for this seat during takeoff and landing. This is a bassinet location and passengers traveling with infants may be seated in this area. 15 C None No Power Seat 15 C is an Economy Class Bulkhead seat that has extra legroom. The tray table is in the armrest, making the armrest immovable and slightly reducing seat width. There is no floor storage for this seat during takeoff and landing. This is a bassinet location and passengers traveling with infants may be seated in this area. 15 D None No Power Seat 15 D is an Economy Class Bulkhead seat that has extra legroom. The tray table is in the armrest, making the armrest immovable and slightly reducing seat width. There is no floor storage for this seat during takeoff and landing. This is a bassinet location and passengers traveling with infants may be seated in this area. 15 E None No Power Seat 15 E is an Economy Class Bulkhead seat that has extra legroom. The tray table is in the armrest, making the armrest immovable and slightly reducing seat width. There is no floor storage for this seat during takeoff and landing. This is a bassinet location and passengers traveling with infants may be seated in this area. 15 F None No Power Seat 15 F is an Economy Class Bulkhead seat that has extra legroom. The tray table is in the armrest, making the armrest immovable and slightly reducing seat width. There is no floor storage for this seat during takeoff and landing. This is a bassinet location and passengers traveling with infants may be seated in this area. 15 G None No Power Seat 15 G is an Economy Class Bulkhead seat that has extra legroom. The tray table is in the armrest, making the armrest immovable and slightly reducing seat width. There is no floor storage for this seat during takeoff and landing. This is a bassinet location and passengers traveling with infants may be seated in this area. 15 H None No Power Seat 15 H is an Economy Class Bulkhead seat that has extra legroom. The tray table is in the armrest, making the armrest immovable and slightly reducing seat width. There is no floor storage for this seat during takeoff and landing. This is a bassinet location and passengers traveling with infants may be seated in this area. 15 K None No Power Seat 15 K is an Economy Class Bulkhead seat that has extra legroom. The tray table is in the armrest, making the armrest immovable and slightly reducing seat width. There is no floor storage for this seat during takeoff and landing. Passengers requiring a bassinet are sat here. 21 C None No Power Seat 21 C is a standard Economy Class seat. However, the proximity to the lavatory may be bothersome. 21 D None No Power Seat 21 D is a standard Economy Class seat. However, the proximity to the lavatory may be bothersome. 21 G None No Power Seat 21 G is a standard Economy Class seat. However, the proximity to the lavatory may be bothersome. 21 H None No Power Seat 21 H is a standard Economy Class seat. However, the proximity to the lavatory may be bothersome. 22 A None No Power Seat 22 A is an Economy Class seat that may have limited recline due to the exit row behind. The proximity to the lavatory may be bothersome. 22 C None No Power Seat 22 C is an Economy Class seat that may have limited recline due to the exit row behind. The proximity to the lavatory may be bothersome. 22 D None No Power Seat 22 D is an Economy Class seat that may have limited recline due to the exit row behind. The proximity to the lavatory may be bothersome. 22 E None No Power Seat 22 E is an Economy Class seat that may have limited recline due to the exit row behind. The proximity to the lavatory may be bothersome. 22 F None No Power Seat 22 F is an Economy Class seat that may have limited recline due to the exit row behind. The proximity to the lavatory may be bothersome. 22 G None No Power Seat 22 G is an Economy Class seat that may have limited recline due to the exit row behind. The proximity to the lavatory may be bothersome. 22 H None No Power Seat 22 H is an Economy Class seat that may have limited recline due to the exit row behind. The proximity to the lavatory may be bothersome. 22 K None No Power Seat 22 K is an Economy Class seat that may have limited recline due to the exit row behind. The proximity to the lavatory may be bothersome. 23 A None No Power Seat 23 A is an Economy Class Exit Row seat that has extra legroom. 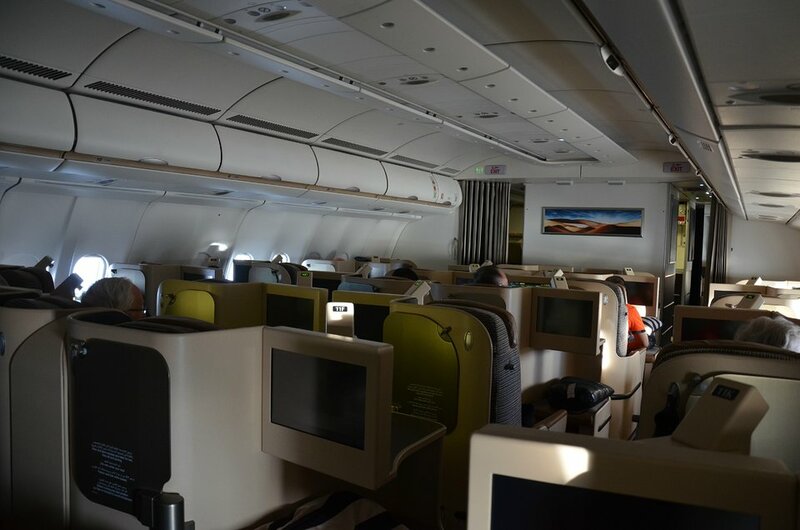 The proximity of the lavatories and galley can be bothersome since passengers often congregate in this area during flight. The tray table is in the armrest, making the armrest immovable and slightly reducing seat width. There is no floor storage for this seat during takeoff and landing. 23 C None No Power Seat 23 C is an Economy Class Exit Row seat that has extra legroom. The proximity of the lavatories and galley can be bothersome since passengers often congregate in this area during flight. The tray table is in the armrest, making the armrest immovable and slightly reducing seat width. There is no floor storage for this seat during takeoff and landing. 23 D None No Power Seat 23 D is an Economy Class Bulkhead seat that has extra legroom. The tray table is in the armrest, making the armrest immovable and slightly reducing seat width. There is no floor storage for this seat during takeoff and landing. This is a bassinet location and passengers traveling with infants may be seated in this area. 23 E None No Power Seat 23 E is an Economy Class Bulkhead seat that has extra legroom. The tray table is in the armrest, making the armrest immovable and slightly reducing seat width. There is no floor storage for this seat during takeoff and landing. This is a bassinet location and passengers traveling with infants may be seated in this area. 23 F None No Power Seat 23 F is an Economy Class Bulkhead seat that has extra legroom. The tray table is in the armrest, making the armrest immovable and slightly reducing seat width. There is no floor storage for this seat during takeoff and landing. This is a bassinet location and passengers traveling with infants may be seated in this area. 23 G None No Power Seat 23 G is an Economy Class Bulkhead seat that has extra legroom. The tray table is in the armrest, making the armrest immovable and slightly reducing seat width. There is no floor storage for this seat during takeoff and landing. This is a bassinet location and passengers traveling with infants may be seated in this area. 23 H None No Power Seat 23 H is an Economy Class Exit Row seat that has extra legroom. The proximity of the lavatories and galley can be bothersome since passengers often congregate in this area during flight. The tray table is in the armrest, making the armrest immovable and slightly reducing seat width. There is no floor storage for this seat during takeoff and landing. 23 K None No Power Seat 23 K is an Economy Class Exit Row seat that has extra legroom. The proximity of the lavatories and galley can be bothersome since passengers often congregate in this area during flight. The tray table is in the armrest, making the armrest immovable and slightly reducing seat width. There is no floor storage for this seat during takeoff and landing. 34 D None No Power Seat 34 D is a standard Economy Class seat. However, this seat may be bumped by service carts or others passing by due to the awkward configuration transition from 4 to 3 seats. 34 G None No Power Seat 34 G is a standard Economy Class seat. However, this seat juts into aisle and may often be bumped by service carts or others passing by due to the awkward configuration transition from 4 to 3 seats. 34 H None No Power Seat 34 H is a standard Economy Class seat. However, the seats in this area feel cramped and narrower due to the curvature of the plane. Also, the seats in this area are misaligned with those in front of them which causes neck strain when watching the personal TVs located on the back of the seats in front. 35 D None No Power Seat 35 D is a standard Economy Class seat. However, this seat may have restricted legroom due to the awkward configuration transition from 4 to 3 seats. 35 F None No Power Seat 35 F is a standard Economy Class seat. However, this seat may have restricted legroom due to the awkward configuration transition from 4 to 3 seats. 35 G None No Power Seat 35 G is a standard Economy Class seat. However, this seat may have restricted legroom due to the awkward configuration transition from 4 to 3 seats. 35 H None No Power Seat 35 H is a standard Economy Class seat. However, the seats in this area feel cramped and narrower due to the curvature of the plane. Also, the seats in this area are misaligned with those in front of them which causes neck strain when watching the personal TVs located on the back of the seats in front. 36 A None No Power Seat 36 A is a standard Economy Class seat. However, the seats in this area feel cramped and narrower due to the curvature of the plane. Also, the seats in this area are misaligned with those in front of them which causes neck strain when watching the personal TVs located on the back of the seats in front. 36 C None No Power Seat 36 C is a standard Economy Class seat. However, the seats in this area feel cramped and narrower due to the curvature of the plane. Also, the seats in this area are misaligned with those in front of them which causes neck strain when watching the personal TVs located on the back of the seats in front. 36 H None No Power Seat 36 H is a standard Economy Class seat. However, the seats in this area feel cramped and narrower due to the curvature of the plane. Also, the seats in this area are misaligned with those in front of them which causes neck strain when watching the personal TVs located on the back of the seats in front. 36 K None No Power Seat 36 K is a standard Economy Class seat. However, the seats in this area feel cramped and narrower due to the curvature of the plane. Also, the seats in this area are misaligned with those in front of them which causes neck strain when watching the personal TVs located on the back of the seats in front. 37 A None No Power Seat 37 A is a standard Economy Class seat. However, the seats in this area feel cramped and narrower due to the curvature of the plane. Also, the seats in this area are misaligned with those in front of them which causes neck strain when watching the personal TVs located on the back of the seats in front. 37 C None No Power Seat 37 C is a standard Economy Class seat. However, the seats in this area feel cramped and narrower due to the curvature of the plane. Also, the seats in this area are misaligned with those in front of them which causes neck strain when watching the personal TVs located on the back of the seats in front. 37 H None No Power Seat 37 H is a standard Economy Class seat. However, the seats in this area feel cramped and narrower due to the curvature of the plane. Also, the seats in this area are misaligned with those in front of them which causes neck strain when watching the personal TVs located on the back of the seats in front. 37 K None No Power Seat 37 K is a standard Economy Class seat. However, the seats in this area feel cramped and narrower due to the curvature of the plane. Also, the seats in this area are misaligned with those in front of them which causes neck strain when watching the personal TVs located on the back of the seats in front. 38 A None No Power Seat 38 A is an Economy Class seat located in the last row of the plane and may have limited recline. The proximity to the galley may be bothersome. Also, you will be among the last passengers to deplane upon arrival. 38 C None No Power Seat 38 C is an Economy Class seat located in the last row of the plane and may have limited recline. The proximity to the galley may be bothersome. Also, you will be among the last passengers to deplane upon arrival. 38 D None No Power Seat 38 D is a standard Economy Class seat. However, the proximity to the galley may be bothersome. 38 G None No Power Seat 38 G is a standard Economy Class seat. However, the proximity to the galley may be bothersome. 38 H None No Power Seat 38 H is an Economy Class seat located in the last row of the plane and may have limited recline. The proximity to the galley may be bothersome. Also, you will be among the last passengers to deplane upon arrival. 38 K None No Power Seat 38 K is an Economy Class seat located in the last row of the plane and may have limited recline. The proximity to the galley may be bothersome. Also, you will be among the last passengers to deplane upon arrival. 39 D None No Power Seat 39 D is an Economy Class seat located in the last row of the plane and may have limited recline. The proximity to the galley may be bothersome. Also, you will be among the last passengers to deplane upon arrival. 39 F None No Power Seat 39 F is an Economy Class seat located in the last row of the plane and may have limited recline. The proximity to the galley may be bothersome. Also, you will be among the last passengers to deplane upon arrival. 39 G None No Power Seat 39 G is an Economy Class seat located in the last row of the plane and may have limited recline. The proximity to the galley may be bothersome. Also, you will be among the last passengers to deplane upon arrival. 5 C None No Power Seat 5 C is a standard Business Class Bulkhead seat. 5 E None No Power Seat 5 E is a standard Business Class Bulkhead seat. This is a bassinet location and passengers traveling with infants may be seated in this area. 5 F None No Power Seat 5 F is a standard Business Class Bulkhead seat. This is a bassinet location and passengers traveling with infants may be seated in this area. 6 A None No Power Seat 6 A is a standard Business Class seat. However, the proximity to the galley may be bothersome. 6 D None No Power Seat 6 D is a standard Business Class seat. However, the proximity to the galley may be bothersome. 6 G None No Power Seat 6 G is a standard Business Class seat. However, the proximity to the galley may be bothersome. 6 K None No Power Seat 6 K is a standard Business Class seat. However, the proximity to the galley may be bothersome. 7 A None No Power Seat 7 A is a Business Class Bulkhead seat that has extra legroom. However, the proximity to the galley and lavatory may be bothersome. This is a bassinet location and passengers traveling with infants may be seated in this area. 7 E None No Power Seat 7 E is a Business Class Bulkhead seat that has extra legroom. However, the proximity to the galley and lavatory may be bothersome. This is a bassinet location and passengers traveling with infants may be seated in this area. 7 F None No Power Seat 7 F is a Business Class Bulkhead seat that has extra legroom. However, the proximity to the galley and lavatory may be bothersome. This is a bassinet location and passengers traveling with infants may be seated in this area. 7 K None No Power Seat 7 K is a Business Class Bulkhead seat that has extra legroom. However, the proximity to the galley and lavatory may be bothersome. This is a bassinet location and passengers traveling with infants may be seated in this area. 9 A None No Power Seat 9 A is a Business class seat that has a misaligned window. 9 K None No Power Seat 9 K is a Business class seat that has a misaligned window. 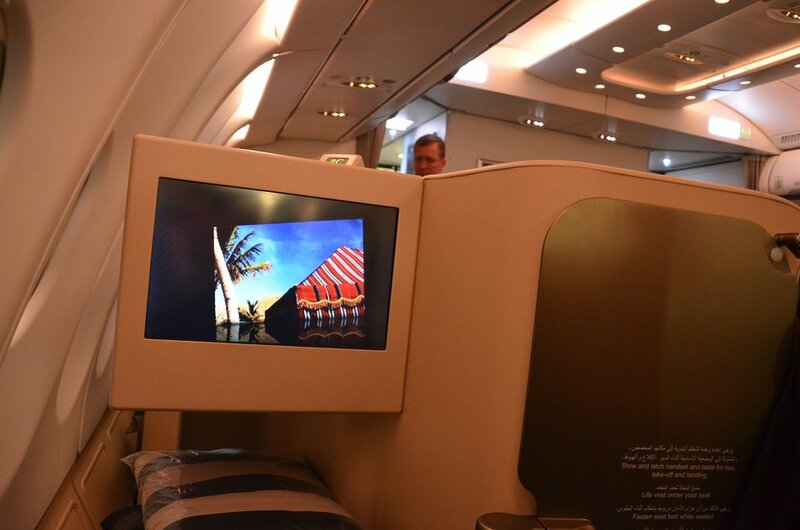 Each seat has a personal video screen with Audio Video on Demand (AVOD). The Diamond First Class has 23-inch LCD screens, the Pearl Business Class has 15-inch LCD screens, and the Coral Economy Class has 10.4-inch screens. 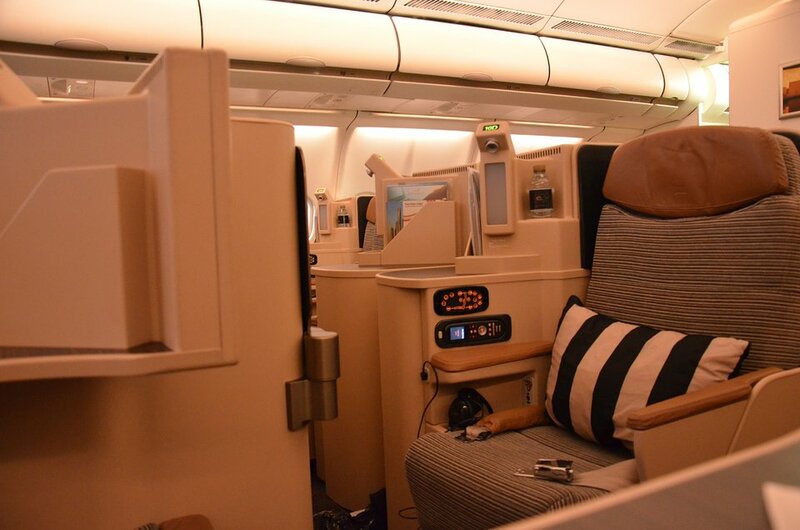 Some A330-300 aircraft have been equipped with Etihad's "Wi-Fly" product. Passengers may purchase one hour of service for $13.95 or 24 hours of service for $24.95. The service is complementary for Diamond First Class passengers. Etihad Airways operates the A330-300 on long-haul flights and it features 3 classes of service: Diamond First, Pearl Business, and Coral Economy. Etihad Airways uses the following naming convention: Diamond First for First Class, Pearl Business for Business Class, and Coral Economy for Economy Class. This aircraft flies with 8 seats of First Class, 32 seats of Business Class, and 191 seats of Economy Class. The Diamond First Class seats are luxurious closed suites with sliding doors for complete privacy. The suite has a perfectly flat, 6 ft 8 inch, extra wide bed with in-built massage, a 23-inch cinematic widescreen, a personal mini-bar, and a personal wardrobe. Passengers flying First Class also receive cosy blankets, pure dupion silk and cotton duvet, fitted sheets, full-sized pillows and loungewear. The center suites have a movable divider between them, making them perfect for passengers travelling in couple. The Coral Economy Class offers a 31.5 to 33-inch seat pitch depending on where you sit on an individual aircraft. 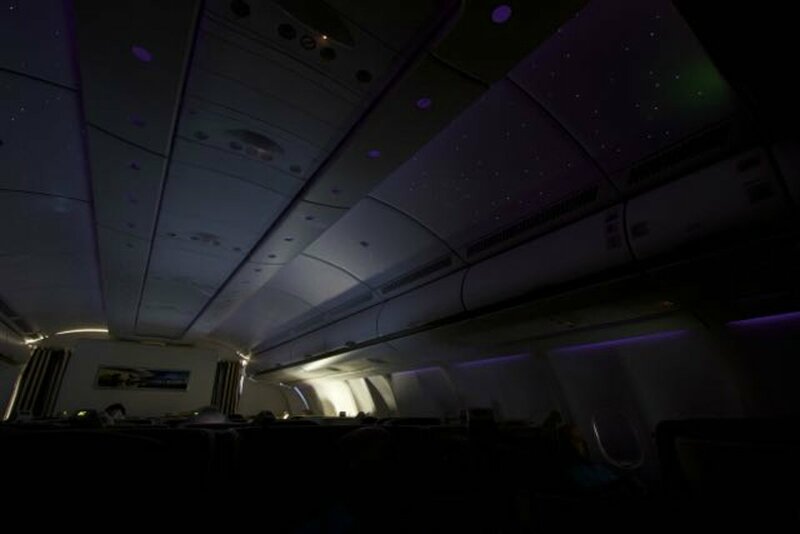 The cabin is fitted with cradle-style seats that slide foward as well as recline and mood lighting that is adjusted to suit the time of day. Economy Class passengers can enjoy a variety of entertainment programs on a 10.4-inch LCD screen available at every seat. Also, all seats also have USB ports, PC power sockets and RJ45 sockets. 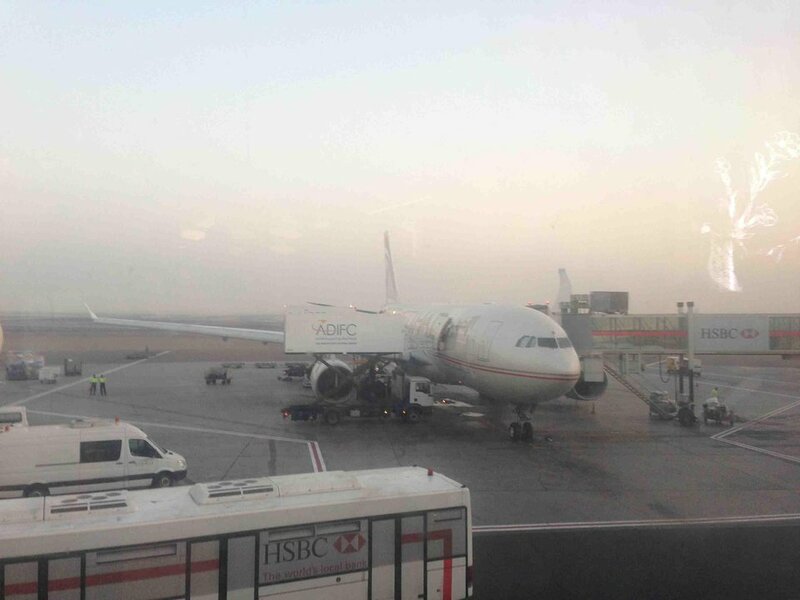 Etihad flies 1 versions of Airbus A330-300 (333).